FREE and fast freight of this TRADING PC to most suburbs Australia including Adelaide, Brisbane, Cairns, Canberra, Gold Coast, Melbourne, Perth, Sunshine Coast & Sydney. Looking for the perfect processor to build your Trading PC rig around? But you also want to edit your action videos and photos? To do this, you know you need serious performance. 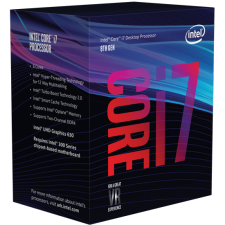 Choose the 8th generation Intel Core i7 processor for whatever you want to accomplish. Because the only thing more amazing than Intel® technology is what you’ll do with it. Intel i7 8700K CPU & GeForce GTX1050 gaming card makes this a great fast i7 trading PC. TUF PC motherboards are specially designed and tested to survive and thrive in conditions where other boards would struggle. Engineered with highly durable components, these motherboards deliver unwavering stability that last as long as you demand. ASUS is the world's foremost pc motherboard manufacturer, renowned for our unique Design Thinking approach. Our exhaustive testing exceeds industry standards, supported by high-quality components for exceptional real-world protection. Our PC motherboards are proven to be compatible with more than 1,000 components and devices, and each new model undergoes a minimum of 8,000 hours of strict validation. ASUS gives you the peace of mind of knowing that your trading PC motherboard is fit for all environments and applications. By choosing ASUS, you also gain the freedom to select outstanding component options, for best PC experiences. Heatsink on the RAM keeps the RAM cooler and thereby increases its performance and life. With Dual Channel DDR4 RAM, the data path is doubled by using two sticks of DDR4 memory. By giving the CPU/north bridge another data path to the memory, bandwidth is effectively doubled. In simple terms, think of Dual Channel DDR as widening the bridge by adding two more lanes. This effectively allows more data to travel faster; much like traffic moving faster when there’re more lanes to drive in. We use A-Grade RAM in all our trading computers such as G.SKILL, Crucial, Corsair and Kingston. 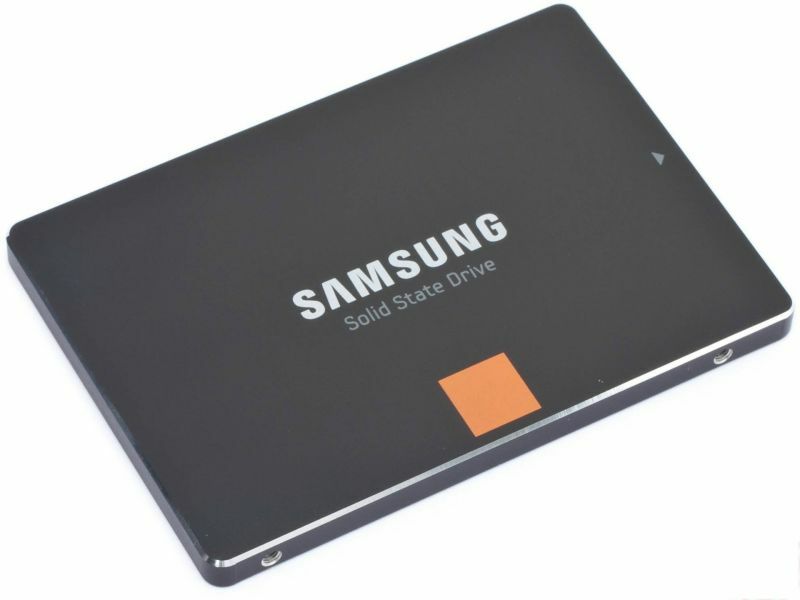 We use A-Grade Samsung, WD or Intel SSDs on all our trading computers. Trading computers need speed and reliability. No moving parts results in a quiet, cool, highly-rugged solution that offers up to 10x faster system responsiveness1 than traditional hard disk drives. Boot time, application launches, file loads, sleep recovery, benchmarks; each activity is faster. Low power consumption & up-to 100% longer life. From running a virus scan to rendering video clips - everything is faster with a SSD. Everyone deserves great speed. That’s why we created the fast, powerful GeForce® GTX 1050. Now, you can turn your PC into a true trading PC, powered by NVIDIA Pascal™—the most advanced GPU architecture ever created.. Ideal for fast display of trading charts and for Bitcoin mining. Faster & Quieter, the GeForce® GTX 1050-Ti comes equipped with dual fan design for 2X greater air flow. While exclusive Auto-Extreme Technology with Super Alloy Power II components for superior stability. Get the most out of your trading PC with this latest GeForce graphics card from nVidia. The latest 6GB GTX 1660 displays on up to 4 monitors and is much faster compared to the GTX1050 and GTX 1050Ti cards. 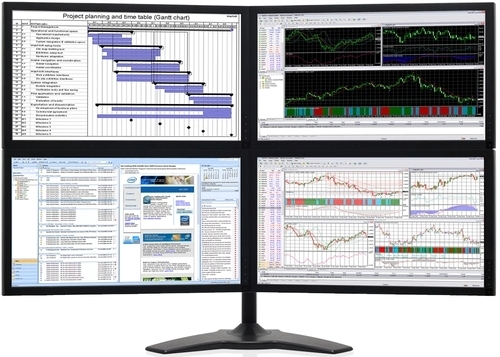 Display on up to 4, 5, 6 Monitors. Upgrade to display on up to 8 Monitors - 2 x 3GB GTX1060 -$850. Includes Motherboard and power supply upgrade as well. 23rd Anniversary Special Offer Supertech Computers has been supplying high quality Trading computers in Australia for over 23 years. 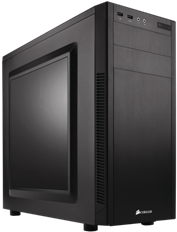 To celebrate our 23rd anniversary, we are offering some great specials including Free delivery of this trading PC to Adelaide, Brisbane, Cairns, Canberra, Gold Coast, Hobart, Melbourne, Perth, Sunshine Coast & Sydney. You have the option of either the standard 300Mbps WIFI card or the faster dual-band AC1200Mbps WIFI card which also provides greater coverage and has Bluetooth as well. Sophisticated cooling technology is essential to the proper operation of all modern CPUs. The choice of cooling technology impacts both the performance and the acoustics of a PC. The superior performance of the Liquid Cooling Thermal Solution makes it the right choice for over-clocking enthusiasts and users of CPU intensive software including applications for digital content creation, CAD, engineering simulation, scientific modelling, financial modelling, Photo / Video Editing and trading. Why buy Trading Computers from Supertech Computers? Supertech Computers is a Multi Award Winning computer company that has been supplying high quality new desktop trading computer packages since 1995. With over 23 years in the trading computer industry experience, we have the knowledge and tools to build high quality computers at a cheap price. We always have all our trading computers in stock and and if you want to pick it up then we can have it ready within 5 hours. We offer fast delivery all over Australia - generally delivered within 1 to 3 days. All our trading computers come standard with full manufacturer warranty, Free lifetime unlimited phone support and free remote login support. "Thank you so much to you and the team at Supertech Computers for the excellent customer service. It is truly amazing how quick your turn around is from ordering a computer to receiving the computer as we are in a rural area and also ordered a custom made computer (Ordered 12th March and received 14th March). It has arrived in excellent condition – packaging undamaged. I have now opened and set up our trading computer. I am blown away at how lightning fast & silent the computer is. I definitely recommend anyone looking for a trading computer to go to Supertech Computers. I have numerous charts & platforms open at the same time and there is no lag time, colour is awesome. As I don’t have a Facebook or any type of account like that, I am happy for you to put my reply on your review page. I will definitely buy my next computer from you. When building trading computer, we use high quality brands such as Intel, Gigabyte, Western Digital, Kingston, Samsung and Asus to name a few. Let our highly knowledgeable and skilled consultants discuss your trading computer needs and requirements with you. So before you buy a i7 trading computer, give us a call on 1300 89 15 30 or 0403 326 639. Most of our customers use this PC for Metatrader or other trading platforms. At Supertech Computers we take the greatest care in every TRADING COMPUTER that we build. Our technicians check every detail before any of our gaming computers leave our stores. All our trading computers are on the test bench for at-least 48 hours and have to pass a stringent series of tests before they are sent from our warehouse to our shops. Buying this i7 Trading computer is very easy. You can buy it online now by selecting the options that you want and then clicking on the BUY NOW button above or by calling us on 1300 891 530 or 0403 326 63. For Supertech Computers, customer service and quality of parts is paramount. We will not compromise on quality just to sell cheap trading computers. All images for this trading pc are for illustration purposes only. Specifications, pricing and promotions are subject to change without notice. Please confirm all details when placing the order. errors and omissions excepted.